This article offers some important Scotch Guard and Fabric Protection Information for your New Sofa, Couch or Upholstery in Birmingham AL. Did you just purchase a new Sofa, Love Seat, Couch or Upholstery? Or, are you considering purchasing new Upholstered Furniture? If so, read this article before you buy anything. This article will give you some great tips on what types of fabric to buy and what type not to buy in order to clean and maintain your furniture. If you are considering buying a cloth Sofa, Love Seat or any Upholstered furniture make sure you check what type of fabric it is before buying. There are 4 common codes that manufactures place on Upholstered furniture. They are Code “W,” “S,” “W-S,” and “X.” Make sure you understand these codes before you buy because you could end up having a hard time cleaning your furniture if you select the wrong code. The easiest to clean Upholstery is coded either “W” or “W-S.” “W” stands for Water and means that these types of fabrics can be cleaned with Water or a Water soluble solution. Code “W-S” fabrics can be cleaned with either water or solvent based products. So you could use a mild solvent, an upholstery shampoo, or a mild detergent on them. Fabrics that are coded “S,” or “X” are more difficult to clean. Code “S” stands for Dry Clean Only and cannot be cleaned with a Water-based solution. If you do put water on it or try to clean with water it will create a water spot and could ruin your furniture. On these types of fabrics, you should try to use a mild water-free cleaning solvent or dry cleaning product. Also, you will need to make sure that your room is well ventilated and there are no open flames when you are cleaning as these types of solvents are flammable. So, you should not clean if you are smoking cigarettes, or burning candles or a fireplace. Fabric coded “X” is also not a good type to buy because you CANNOT use ANY Cleaning agents on it, whether they are water-based or solvent-based. All you can do to clean this type of fabric is to vacuum or gently brush it. If you use water or solvent based cleaning products on this type of fabric it may cause staining, shrinkage or distortion of the fabric surface pile. We DO NOT recommend purchasing any Upholstery coded “S” or “X,” and especially not if you have children or pets. We DO recommend that you purchase Upholstery coded “W” or “W-S,” as both of these types can be cleaned. After you purchase your new furniture, you should also have Scotch guard or Fabric Protection applied immediately. 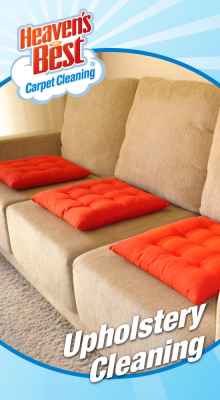 This will help to protect the furniture from spots or stains and make it much easier to clean if you do have a spill. Heaven’s Best Carpet & Upholstery Cleaning can Clean and Scotch guard your Sofa, Love Seat, Couch or Upholstery. We offer great rates and excellent service. We recommend having your fabric protected with Scotch Gard as soon as you bring it into your home. Call us today at (205) 618-9150 for a FREE ESTIMATE on Scotchguard and Fabric Protection for your New Sofa, Couch or Upholstery in Birmingham, AL.